Running now through October 14, catch Essential family member Bart Hansard as Pozzo in 7 Stages’ 40th season opener, Waiting for Godot by Samuel Beckett. Lots of other Essential friends have worked behind the scenes to bring this production to life as well: Efrem Whitaker (2010 Darker Face of the Earth and 2017 BeltLine & Beyond) and Jennifer Kimball (Essential Managing Director) make up the stage management team, and 2018 Festival designers Kacie Willis (sound design, Woke) and Josh Oberlander (Festival set design) also lent their support in the creation of the show. 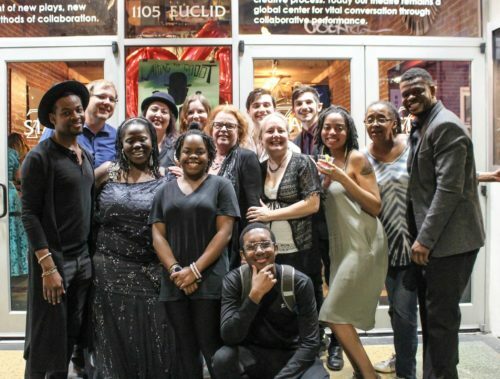 The 2018 GODOT team on opening night at 7 Stages! And there’s more Essential goodness in store in 7 Stages’ 40th season: Topher Payne’s Angry Fags returns to their stage in March 2019!